The word "Biryani" has always made my mouth water, always made me crave for some, no matter what time of the day/night it is, even if I'm already full, I can always use some biryani. Ever since I have started to try my hands on chicken, I have tried various different types of chicken biryanis such as Hyderabadi Biryani, Malabar Dum Chicken Biryani, Ambur Chicken Biryani, and more.. So the thought of trying out biryanis from fish also clicked me. And here it is !! 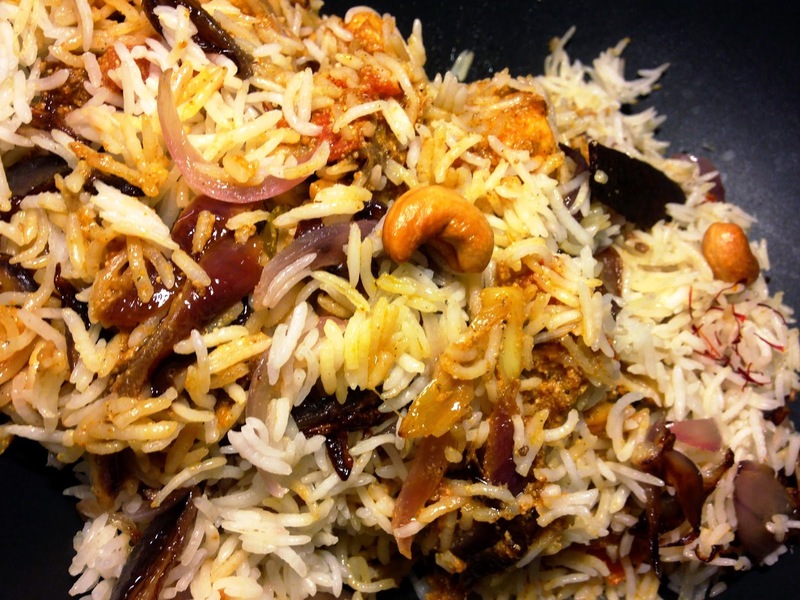 Presenting my wonderful Malabar Fish Biryani. This one is a little more time consuming than usual, but get your ingredients right, with fresh fish on your hands, music in the background and the quiet of the weekends, and you are sure to deliver this aromatic and delicious flavour blended in the biryani and everyone is sure to keep asking for more..
Wash and cut the fish into pieces. Make a mix of the marinade ingredients and marinate the fish in it for 20 minutes. By that time prepare other things. Heat oil/ghee in a pan and fry the cashew nuts and raisins. Drain from the ghee and keep aside. In the same pan, fry one sliced onion which is to be used for the biryani. Fry on medium heat until golden brown and crispy. Drain ghee/oil and keep aside. Wash the rice and boil the rice as you would do normally. This is how I make it: How to make the perfect boiled rice. Heat 2 tsp. oil for the rice and add cardamoms, pepper, cloves and cinnamon. Mix well and add the sliced onions. Fry till they are transparent and add this complete mix to the rice. Add the lemon juice and mix well. Cover the rice and keep aside. Heat the same oil and fry the marinated fish on medium flame. Fry till both sides are done and are golden brown. Drain from the oil and keep aside. Heat up the oil and add little more oil if required. Add the sliced onions and fry until they are transparent. Add ginger, garlic, green chillis and mix well. Let cook for 2 minutes. Add mint leaves, coriander leaves and curry leaves. Mix well and add the tomatoes. Add little salt, red chilli powder and coriander powder. Mix everything well and let cook till the tomatoes become completely soft. Add poppy seeds, garam masala and yoghurt. Mix well and let cook for 2 minutes. Add the fried fish pieces. Cook for another 2 minutes and turn off the flame. Now take a deep bottomed vessel and add a layer of this fish masala. Add another layer of rice and add half the cashews, raisins and fried onions. Add another layer of fish masala, another layer of rice and the remaining cashews, raisins and fried onions. Add the saffron on the top. Cover this vessel with a tight lid and put it on low flame for 10 minutes. Remove from heat, let remain covered for another 10 minutes. Remove cover, mix well and serve hot.